Barefoot Sale Tomorrow & Saturday! This is the weekend to make good on your Barefoot discount! Tomorrow and Saturday, Oct. 14 and 15, members of our Barefoot Club will receive 20% off of their total purchase (classes and quilting services not included). Not a club member? Not a problem-you can join the Barefoot Club and use the discount that same day and it will pay for itself! We've just added Block 6 to our Neighborhood! Per our valued customers' requests we will keep all of the blueprints available on the website until Dec. 24. Here is our Block 6-we've added a little fun to our window. Click here to download Block 6. Be the first to bring in a completed Neighborhood quilt (quilted and bound) and win a prize from Quilt Patch! This Saturday, Oct. 15, is our Saturday Night Sew! 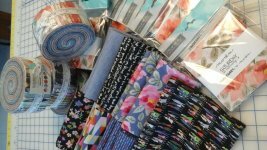 Join us from 3:30-8:30 for some quality quilting time. Everyone is welcome! Cost is $2 and we order out for dinner. Just call us and reserve your spot (704-821-7554). 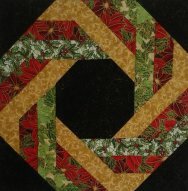 Time is growing short to have your quilts quilted in time for Christmas! Bryan's cut off date is November 1, and Kay Giese's cut off date is November 15. After that you will not be guaranteed delivery for Christmas. 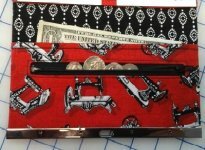 This adorable wallet will make perfect holiday gifts for your family and friends! Stretch your skills with this jelly roll friendly quilt, using 90 degree triangles. Make just one 21" wreath block, add borders and it's a lovely seasonal wall hanging for Fall, Christmas, Easter, 4th of July-the possibilities are unlimited! Pajama Party Quilt Retreat NEW RETREAT ADDED!